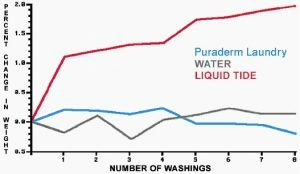 Home / Articles / CLEMSON UNIVERSITY – Tests to determine the rinseability differences between Puraderm Laundry and Liquid Tide. CLEMSON UNIVERSITY – Tests to determine the rinseability differences between Puraderm Laundry and Liquid Tide. The graph was obtained from testing rinseability of cotton during numerous wash cycles. Detergents were Puraderm Laundry and Liquid Tide. Also cycles were completed using water only (control). Conditions during the wash cycle were determined by AATCC Test Method #61. Observing the graph you will note that cotton washed with Liquid Tide gained nearly 2% in weight in only 8 washings while the weights of cotton washed in Puraderm Laundry and water remained basically unchanged. Puraderm Laundry rinsed out completely and Liquid Tide did not.